Manageable sized menu of appetizers, salads, and pizzas with mouth-watering topping combos. Some of them are even named after St. Louis-y things like the Turtle Park pizza and the Tamm Clayon. Small, but colorfully fun. It makes you want to hang out and have a pint and a slice. What a coincidence, that’s the name of one of their specials. Waitstaff was patient with us, since “some of us” take forever deciding what we want, erghm. 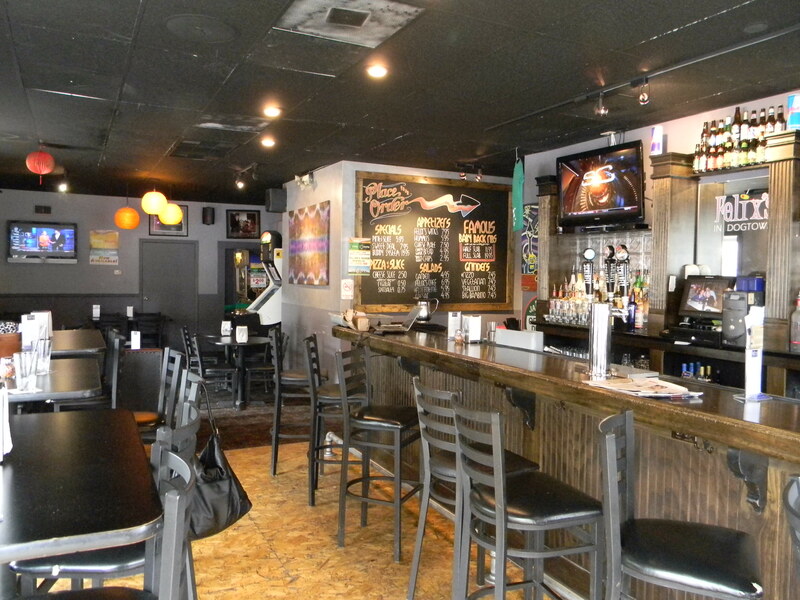 The place is not super-duper busy at lunch, but hey we like to feel like we own the joint. If you happen to bring your K-9 by, they have water dishes and treats available. Aaawww. I didn’t partake, so there! Alright. Considering this is a side salad, it’s huge and definitely sharable. 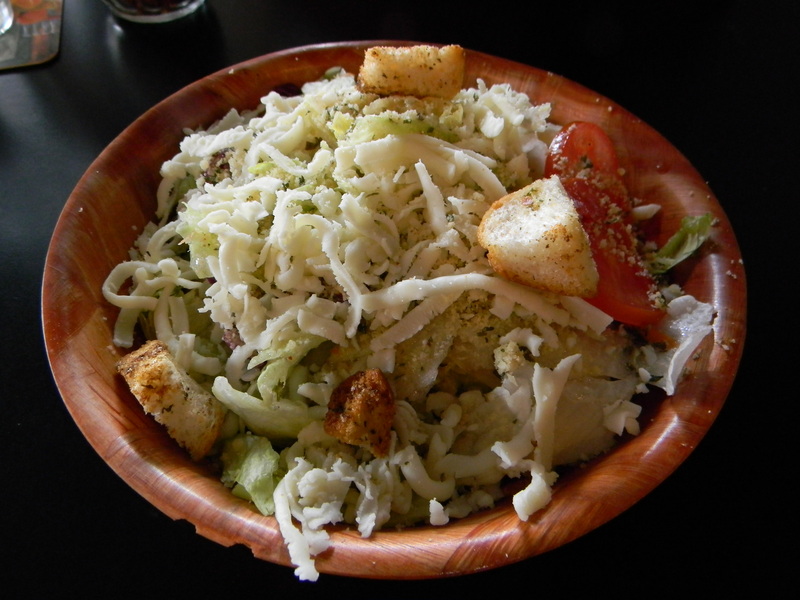 The Italian dressing they toss it in is great…and totally makes up for the fact that you are eating iceberg shreds! Not too overwhelming. And the croutons are delicious little bread morsels. 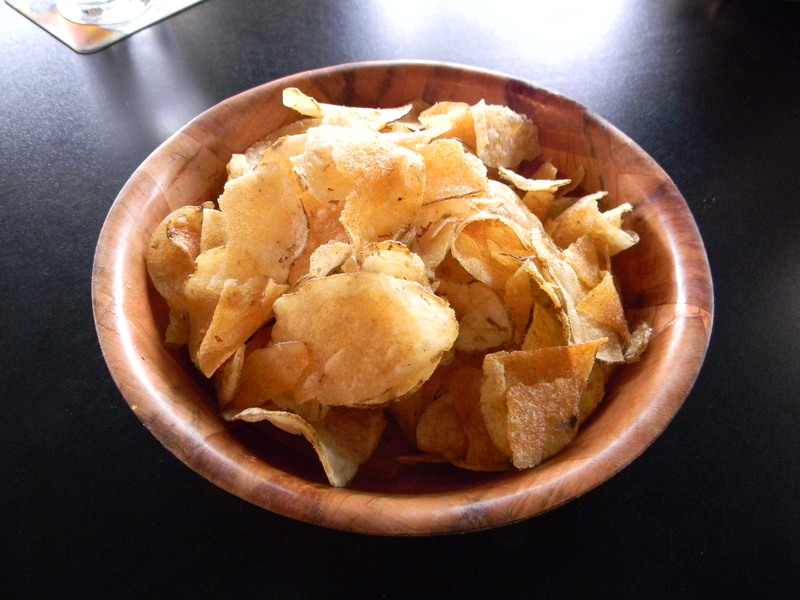 Fabulous – These are by far the best chips around. If you don’t like these little billies, then there is something wrong with you. I once shared a large bag with J.J. and in less than 24 hours they were gone – two things were learned from that experience 1. don’t ever buy the big bag again and 2. enjoy them in the small doses they are given. Amazing….as always. These chips are taking over St. Louis! I guess that makes sense since they are made here. Crispy and you can savor the grease they are fried in! Fabulous – I was pleasantly surprised by the flavor combo. Thanks, Michelle, for this pick. I will be getting this one the next time I’m here. Amazing! The toppings look overloaded, but fear not it’s just right. Everyone knows that bacon and ranch make everything amazing. The seasoned crust was a happy ending to my pie. Between the huge slice of pizza and the oversized salad, I am 100% certain I got my money’s worth for lunch. Fabulous – I did not plan to order this, however our friendly waiter suggested it. I am glad he did. It was super juicy and tender and flavorful. I got this with Mozzarella (because it’s real cheese). Amazing! Talk about juicy meets flavor! 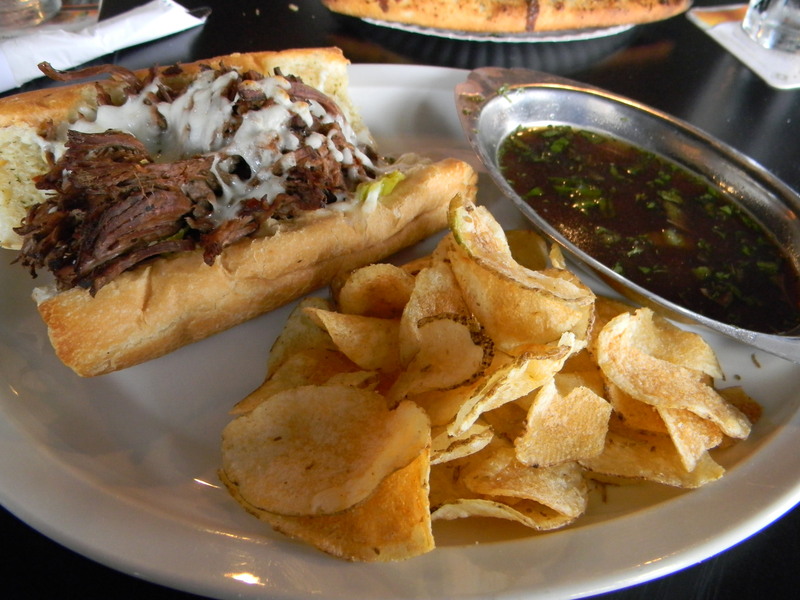 You don’t even need the au jus. I needed provel, not mozzarella, but I’ll let is slide since my colleague is not from the STL and is a “disliker” of the provel. 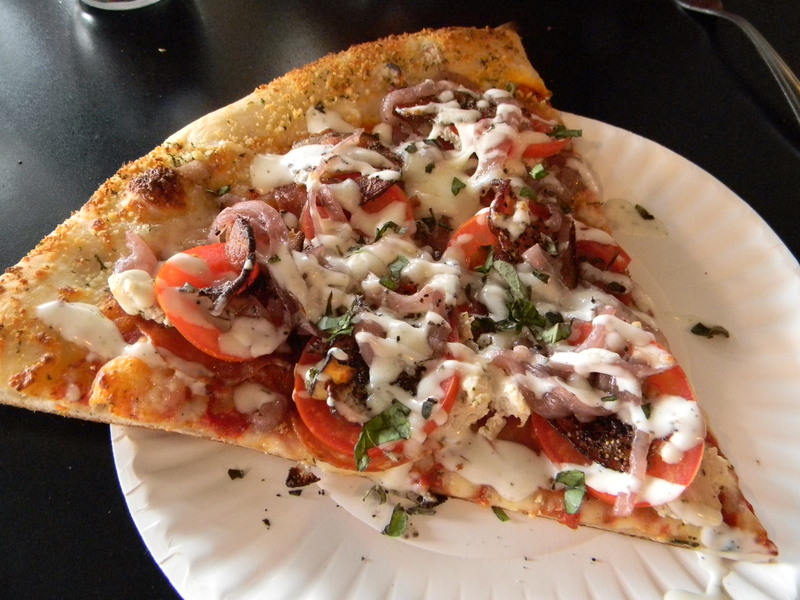 COME HUNGRY….COME BACK TO DEFINITELY TRY THE RIBS…..ON A PIZZA. As a St. Louis original whose heart belongs in Wisconsin, I feel that I need to weigh in on the Provel issue. Here is a link to the Provel cheese wiki page. This is a definite Happy Hour place and ditto on the (blech) provel. Sorry St. Louis – you can keep your cheese! Thanks for stopping in & having lunch with us! We’re glad you enjoyed yourselves & our food! Come back anytime!